In our Declaration, which itemizes certain self-evident rights among innumerable others, consent of the governed is the just basis of government, whose purpose is to secure our rights. Consequently, it follows that a government that secured rights, yet did so without the consent of the governed, was not just. An absolute, benevolent monarch ruling a happy and prosperous people, one who secured the people’s right to Life, Liberty, and the Pursuit of Happiness, violates Natural Law justice because rule without the consent of the governed is tyranny. Tyranny cannot be just. Yet, isn’t this the sort of rule the Progressive Left promises? Progressives clamor for ever-more direct elections by one-and-all, for self-proclaimed benevolent politicians from representatives, senators to presidents. But, after elections, they do not expect the people to influence their rulers. The Left dreams of an elective despotism. After electing kind and moral Progressives, the people are to sit down, shut up, and do as they are told. Progressives tell us that “all men are created equal” was a crude and misogynist 18th century way of proclaiming equal stuff for everyone as a right. Of course, the Left disdains “Life, Liberty and the Pursuit of Happiness” as silly bourgeois prattle. This isn’t what the Framers had in mind, yet does the Left’s Utopian dream of despotic, yet benevolent government satisfy the Declaration’s “consent of the governed” since the legislative (and the un-Constitutional administrative/regulatory) power is in the hands of those elected by the people? The Progressives’ working form is little different from Alexander Hamilton’s sketch of government presented to the federal convention on June 18th, 1787. On this day, he expressed what some others thought, that state sovereignty was the central problem with the Articles of Confederation. Therefore, do away with state sovereignty. Now, as opposed to today’s Progressives, the men Hamilton envisioned to occupy the highest reaches of government were not social justice warriors, but rather members of the natural aristocracy which emerges in all free societies. Hamilton wished to go as far as republican principles would allow. Grant elective lifetime appointments to senators and a chief executive. Would this satisfy consent of the governed? Yes, as far as Hamilton was concerned, if the people or their representatives make the elections or appointments. An executive for life wouldn’t need to expand his powers or enrich others. Hamilton believed a monarch for life to be safer than one for a period of years. Roman Emperors and the executives of Poland and Germany were all elected by select groups. The American Union could devise safeguards to prevent tumults associated with elected executives. So, like Alexander Hamilton, today’s Progressives don’t trust the people at all beyond electing their rulers. From the draft Constitution, which limited the democratic element to one half of one of the three branches, and hopefully somewhere near 30,000 citizens for each representative, our Framers satisfied the first principle of just government, the consent of the people. They knew the history of overly democratic republics from ancient to modern times. Like fire, which was both dangerous yet necessary, so too was the limited consent of the people necessary to national happiness and longevity. On the other hand, early Progressives regarded the franchise as a self-evident right, just like equality between all men. In their view, state legislative appointment of senators and the electoral college were mistakes. 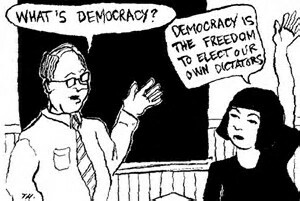 Who could disagree with the logic that if a little democracy was good, lots of it must be grand? However, in recent times, Progressives let slip their mask; ever-more democracy is not merely a right, it is also the means to social justice, the validation of immediate desires and passions, which is a horrid corruption of our Founders’ Natural Law justice. The explosion of the democratic element since the direct election of senators, voting by women, repeal of Jim Crow, abolition of poll taxes, lowering the voting age to eighteen, extension of voting from a single day to a couple of weeks, same day registration, motor voter, voting rights for ex-convicts, and provisional ballots, . . . all serve to extend the franchise to an ever-expanding portion of the public. But, to what end? A practically unlimited franchise is, to Progressives, also the means to an end – social justice. In addition, when an action is practically unlimited, when there are few limitations, over time the action becomes an assumed right. Rather than serve as the means to a just end, Progressives (with lots of help from Scotus) have warped an expansive franchise into a right that supersedes all others. To the Framers, consent of the governed in the form of a limited right to elect reps to the House comprised a just means to a desired end – free government. The limited franchise is both a right and the means to an end – free government. To Progressives, an ever-expanding right for one and all to vote for unencumbered rulers is the just means to an unjust end – social justice. Everyone, citizen and illegal alien alike, have a nearly unlimited franchise right, which is the necessary means to a despotic end. The unlimited franchise is a right superior to others, as well as the means to an end – despotic government. Over the course of the next couple of squibs, I will first examine the Framers’ perception of the franchise, and close with what Progressives have done to the Framers’ legacy.